“China & India must play a leading role in reducing GHG emissions and develop ‘clean’ energy economies.” This is repeated often by other nations, environmentalists, and anyone who feels like dispensing advice. I take some issue with China & India being put in the same bucket when talking about GHG reductions and the level of action demanded by the rest of the world. Not because I don’t think India should be taking action, but I think the actions need to be different. There isn’t a one-size-fits-all solution here (if at all there is “a” solution to begin with!). 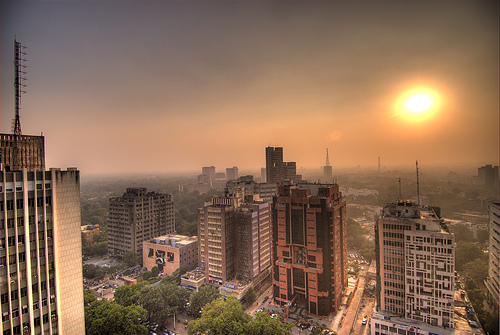 Connaught Place, Delhi. Flickr photo by wili_hybrid. For the last couple of weeks, the Economist magazine has been talking about the breakneck speed of India’s economic growth and how they believe it will “outpace” China’s. But India has a boat-load of socio-economic issues that China does not have, has a starkly different political system, and her business institutions are very distinct from China’s government-reliant system. Socially, culturally, and demographically, the countries don’t compare that well, either — sort of like apples vs oranges (or may be, mangoes vs dragonfruit?). Thinking about all I’ve been reading about India lately — She sounds like a country of hyperbolic contradictions. I don’t have to explain why I’m sharing these facts about India’s peculiar contradictions on a climate change blog. Contradictions mean conflicting priorities. Which problem will speak louder? Mitigation? Adaptation? Economic Development? Social Services? Resource Protection? Foreign Affairs? The Indian government is evidently focused more on climate change adaptation than mitigation. To a large extent, that sounds prudent, since we know climate change is already underway. But the biggest part of the government’s adaptation strategy is to develop more – the belief is that development is the best route to adaptation. To a large extent that’s true. But what exactly constitutes as ‘development’ and the impacts created by it along the way are of paramount importance, because India cannot afford to end up creating a world that even a highly-developed nation can no longer adapt to — a situation very likely to happen even with the rate of climate change already underway. Representing Himself–Why Are We (sort of) Okay With Ken Cuccinelli’s Witchhunt?